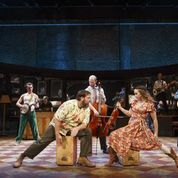 It is a story of love, and it is most certainly a story of music, and when the two come together they weave a tale as sweet as the melodies that bind together all the charms of the musical, ONCE, now playing at Houston’s Hobby Center for the Performing Arts. Right from the beginning, this production (book by Enda Walsh, music and lyrics by Glen Hansard & Marketa Irglova) is a very unusual piece. For starters, before show time the opening set depicts a long and cozy Irish bar adorned with assorted glistening mirrors as it embraces the entire back of the stage. The arriving audience is welcome to amble on stage, buy drinks from the bartender, and sip those cocktails while enjoying an unusual view of the theater from the actors’ perspective. (That novelty would be repeated during Intermission). As the show proper gets underway, we find ourselves in Dublin and begin to meet the assorted working class town characters who frequent this pub, and happily, pass a good deal of time indulging the Irish love of making music. Skillfully directed by John Tiffany, our talented cast of twelve, (plus a darling little girl named Ivanka, sweetly played by Sarah McKinley Austin) has an assortment of musical gifts for piano, guitar, mandolin, banjo, drums, harmonica, ukulele, cello, accordion, violin, concertina, melodica and percussion that sometimes consists of pounding bongo-style rhythms on empty boxes. 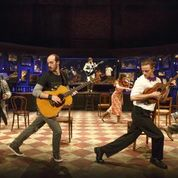 The curtain is never drawn on this open set (designer, Bob Crowley) and very soon, as infectious Irish music explodes across the stage, it can seem at one moment like a country hoedown, and in the next resemble a rousing Jewish wedding. Irish wit peppers the script with humor, while the audience has the feeling of having crashed some joyful party, and indeed, it has. The story that follows is the simple tale of a young would-be songwriter, a Dubliner named Guy (Stuart Ward) who repairs Hoover vacuum cleaners when not strumming his guitar. While singing at the pub, he meets a pretty young Czech woman that the authors have curiously named, Girl. (Dani de Waal). So we have a Guy and a Girl to propel the plot. Better still, the Girl has a Hoover vacuum in need of repair. What could be better than that? Guy is a bit rough around the edges and his music lashes about with an edge of its own that may reflect his longing for the girlfriend he has recently lost to New York across the sea. But meanwhile, Girl sees something special in his musical talent and urges him to pursue those gifts and seek a recording contract. Girl, by the way, has a musical gift of her own on the piano, as audiences will readily note when Miss de Waal displays considerable skill for playing Mendelsohn. Waal has the voice of an angel as well, and that would be apparent in the lyrical delicacy of her stunning and elegant solo for “The Hill” in Act Two. The only disappointment was the lack of an appropriate momentary pause following that song so the audience could erupt in deserved and appreciative applause before the action continued. As the plot moves along there are numerous gay and lively numbers that would have many a foot in the audience tapping, and mine was no exception. (Music supervisor, Martin Lowe). 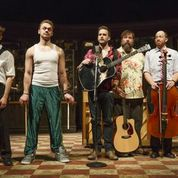 There is sometimes gentle, sometimes foot-stomping and whirling choreography from the energetic cast of players (Movement direction from Steven Hoggett). True to Irish sentiment, there is a poetic and story-telling aspect of these songs that is often wistful and reflective. This is perhaps most apparent in the gentle sweetness of the show’s most familiar tune, “Falling Slowly,” a lush duet for the complementary voices of Girl and Guy as they beautifully deliver the heavenly elevation of the uniquely high notes that close each phrase in the song. The haunting “If You Want Me” is another vocal winner for the duo. 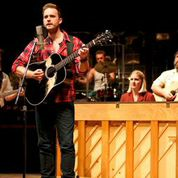 There is wonderful support here from the ever-present ensemble, and that same vocal power enriches Guy’s soaring solo of the beautiful song, “Gold,” that closes Act One amid the gently choreographed movement of the cast. The same tune would be a full company highlight in the mystical a Capella reprise during Act Two that would again conclude by sadly depriving the audience of that moment needed to cheer an exceptional performance. Clearly, Guy and Girl are falling in love, though we learn that her estranged husband is expected to return to Dublin soon to reconcile with his wife and reunite with their young daughter, Ivanka. Ultimately, Girl succeeds in having Guy join forces with their musical friends to cut a studio demo recording of his original songs, but along the way she realizes she belongs with her husband, while Guy and his talent belong across the sea with his lost love in New York and all the music world opportunities that can be found there. How fortunate that we could enjoy this joyous musical journey before that poignant separation. This entry was posted in Broadway, BROADWAY at the Hobby Center, BroadwayStars.com, HereHouston.com, Houston Community Newspapers online, Houston's Hobby Center, ONCE, The TICKET, Theater Reviews, ThePeoplesCritic.com, YourHoustonNews.com and tagged Broadway, BROADWAY at the Hobby Center, ONCE. Bookmark the permalink.